You might find this brief overview helpful for constructing models and understanding errors. For more information, see How Simscape Models Represent Physical Systems. Simscape™ software gives you multiple ways to simulate and analyze physical systems in the Simulink® environment. Running a physical model simulation is similar to simulating any Simulink model. It entails setting various simulation options, starting the simulation, and viewing the simulation results. This topic describes various aspects of simulation specific to Simscape models. For specifics of simulating and analyzing with individual Simscape add-on products, refer to the documentation for those individual add-on products. This flow chart presents the Simscape simulation sequence. The Simscape solver first validates the model configuration and checks your data entries from the block dialog boxes. All Simscape blocks in a diagram must be connected into one or more physical networks. Unconnected Conserving ports are not allowed. Each topologically distinct physical network in a diagram requires exactly one Solver Configuration block. 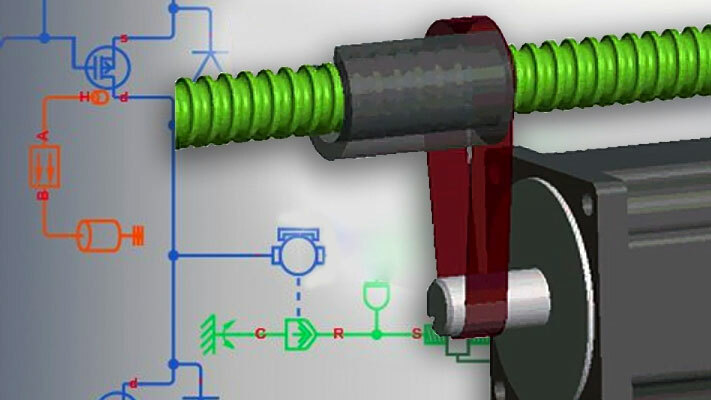 If your model contains hydraulic elements, each topologically distinct hydraulic circuit in a diagram must connect to a Custom Hydraulic Fluid block (or Hydraulic Fluid block, available with Simscape Fluids™ block libraries). These blocks define the fluid properties that act as global parameters for all the blocks that connect to the hydraulic circuit. If no hydraulic fluid block is attached to a loop, the hydraulic blocks in this loop use the default fluid. However, more than one hydraulic fluid block in a loop generates an error. Similarly, if your model contains gas elements, default gas properties are for dry air. If you attach a Gas Properties (G) block to a topologically distinct circuit, you can change gas properties for all the blocks connected to the circuit. However, more than one Gas Properties (G) block in a circuit generates an error. Signal units specified in a Simulink-PS Converter block must match the input type expected by the Simscape block connected to it. For example, when you provide the input signal for an Ideal Angular Velocity Source block, specify angular velocity units, such as rad/s or rpm, in the Simulink-PS Converter block, or leave it unitless. Similarly, units specified in a PS-Simulink Converter block must match the type of physical signal provided by the Simscape block outport. Two directly connected Conserving ports have the same values for all their Across variables (such as voltage or angular velocity). Any Through variable (such as current or torque) transferred along the Physical connection line is divided among the multiple components connected by the branches. For each Through variable, the sum of all its values flowing into a branch point equals the sum of all its values flowing out. Based on the network configuration, the parameter values in the block dialog boxes, and the global parameters defined by the fluid properties, if applicable, the Simscape solver constructs the system of equations for the model. Dynamic — Time derivatives of these variables appear in equations. Dynamic, or differential, variables add dynamics to the system and require the solver to use numerical integration to compute their values. Dynamic variables can produce either independent or dependent states for simulation. Algebraic — Time derivatives of these variables do not appear in equations. These variables appear in algebraic equations but add no dynamics, and this typically occurs in physical systems due to conservation laws, such as conservation of mass and energy. The states of algebraic variables are always dependent on dynamic variables, other algebraic variables, or inputs. The solver then performs the analysis and eliminates variables that are not needed to solve the system of equations. After variable elimination, the remaining variables (algebraic, dynamic dependent, and dynamic independent) get mapped to Simulink state vector of the model. For information on how to view and analyze model variables, see Model Statistics. The Simscape solver computes the initial conditions only once, at the beginning of simulation (t = 0). In the Solver Configuration block dialog box, the default is that the Start simulation from steady state check box is not selected. If it is selected in your model, see Finding an Initial Steady State. The solver computes the initial conditions by finding initial values for all the system variables that exactly satisfy all the model equations. You can affect the initial conditions computation by block-level variable initialization, that is, by specifying the priority and target initial values on the Variables tab of the block dialog boxes. You can also initialize variables for a whole model from a saved operating point. At first, the solver tries to find a solution where all the high-priority variable targets are met exactly, and the low-priority targets are approximated as closely as possible. If the solution is found during this stage, it satisfies all the high-priority targets. Some of the low-priority targets might also be met exactly, the others are approximated. If the solver cannot find a solution that exactly satisfies all the high-priority targets, it issues a warning and enters the second stage, where High priority is relaxed to Low. That is, the solver tries to find a solution by approximating both the high-priority and the low-priority targets as closely as possible. After you initialize the variables and prior to simulating the model, you can open the Variable Viewer to see which of the variable targets have been satisfied. For more information on block-level variable initialization, see Variable Initialization. When you select the Start simulation from steady state check box, the solver attempts to find the steady state that would result if the inputs to the system were held constant for a long enough time, starting from the initial state obtained from the initial conditions computation just described. If the steady-state solve succeeds, the state found is some steady state (within tolerance), but not necessarily the state expected from the given initial conditions. Steady state means that the system variables are no longer changing with time. Simulation then starts from this steady state. A model can have more than one steady state. In this case, the solver selects the steady-state solution that is consistent with the variable targets specified during block-level variable initialization. For more information, see Variable Initialization. After computing the initial conditions, or after a subsequent event (such as a discontinuity resulting, for example, from a valve opening, or from a hard stop), the Simscape solver performs transient initialization. Transient initialization fixes all dynamic variables and solves for algebraic variables and derivatives of dynamic variables. The goal of transient initialization is to provide a consistent set of initial conditions for the next phase, transient solve. Finally, the Simscape solver performs transient solve of the system of equations. In transient solve, continuous differential equations are integrated in time to compute all the variables as a function of time. The solver continues to perform the simulation according to the results of the transient solve until the solver encounters an event, such as a zero crossing or discontinuity. The event may be within the physical network or elsewhere in the Simulink model. If the solver encounters an event, the solver returns to the phase of transient initialization, and then back to transient solve. This cycle continues until the end of simulation.